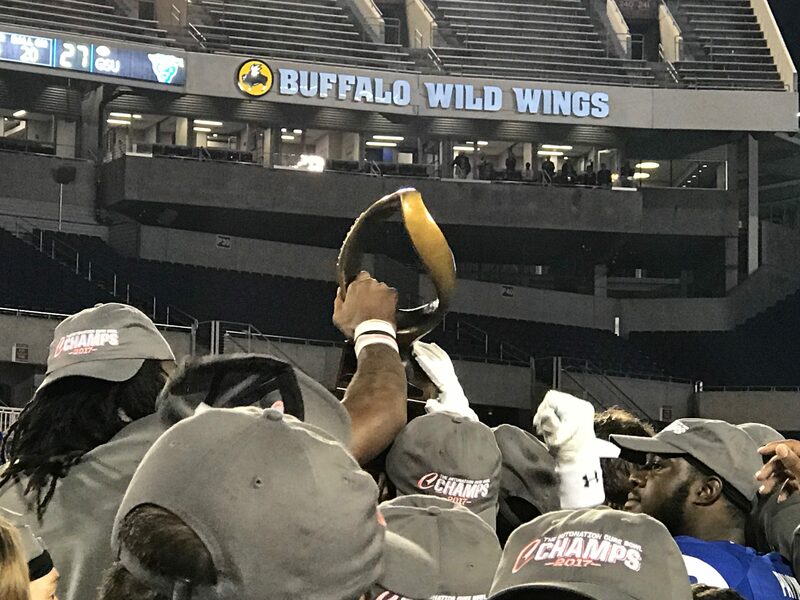 Georgia State (7-5, 5-3) grabbed the first bowl win in school history as they pounced on Western Kentucky (6-7, 4-4) 27-17 in the AutoNation Cure Bowl. Senior quarterback Conner Manning was named Most Valuable Player with 276 yards and one touchdown on 20-28 passing. Head coach Shawn Elliott led the Panthers to their first seven-win season, first winning season in the FBS and best win-percentage (.583). “To win this bowl, the first bowl win in school history, and to set the standard with the most wins in school history, with a great group of seniors going out, to set the standards that will be delivered to the rest of the programs history, that’s amazing. Just what they accomplished,” Elliott said. The Panthers lost 27-16 to San Jose State in the 2015 AutoNation Cure Bowl, the program’s first bowl game. The young program led by a first-year head coach and quarterback who did not begin his career in Atlanta showed that teamwork can overcome adversity. “I told our guys in there and I told them that we are a bunch of misfit coaches with a bunch of misfit players that learned to work hard and love one another, and go out and fight every single day. And when you do that, you have a chance to be successful. And we were successful tonight,” Elliott said. Glenn Smith rushed for 73 yards Demarcus Kirk’s touchdown were a part of the Panthers’ 143 rushing yards. Mackendy Cheridor logged two sacks and forced fumble. Brandon Wright nailed field goals from 42 and 37 yards out. Georgia State broke Cure Bowl records with six sacks, -2 rushing yards allowed, 419 yards of total offense, 21 first downs and eight third down conversions. The Panthers broke through in the third quarter after a few missed opportunities. The Panthers finally stretched their lead to double-digits with a 42-yard double-reverse flea flicker touchdown from Manning to Roger Carter. As part of the Panthers’ near second-half shutout, Jerome Smith intercepted wide receiver Nacarius Fant. Manning directed the Panthers nine-minute drive, including the throw of the day, a fastball in between two defenders to Carter for 23 yards. Kyler Neal capped off the drive with a bruising 1-yard touchdown run, extending the lead to 27-10. White found found Deon Yelder for six late in the fourth quarter, Western Kentucky’s only score of the second half. Georgia State went on to win 27-17 and now enjoys their record-setting game and season. The victory was the last appearance for seniors Manning, Smith, Williams, Cheridor, Neal, B.J. Clay, Trey Payne, Antreal Allen, Justin Lamphear, Trey Payne, James Traylor and Chandon Sullivan.